A breakthrough happened at a local haunted motel this Saturday afternoon when scientists finally made contact with the beyond. Human nature has always led us to wonder about the meaning of life in the universe, and furthermore, what happens to that meaning, our consciousnesses, when we die. At Overtly Spooky Motel in Ithaca, NY, a scientific team led by Fredrick Dedrik has now developed a system through which we can now both speak to and see the dead. In fact, it seems all that separates our world from theirs has been a thin atmospheric barrier. Between global warming, protoplasmic energy exchange, and recent advancements in paranormal science, it was only a matter of time before we broke this barrier down. Surprisingly, scientists are urging those who wish to contact their loved ones to be patient, as ghosts have no identifiable addresses, phone books, or afterlife census data. In fact, it’s difficult to tell if they have any form of society at all. “It just doesn’t get any easier after you die,” Dedrik stresses. Luckily, there have been several support groups created by ghosts for ghosts in an attempt to remedy both those with situational post-departing depression and those with generalized depression. Dedrik wants readers to take comfort in the fact that, despite being trapped in an alternate dimension with no purpose and despite having no professional resources available, ghosts are still banding together to work through their crippling depression. 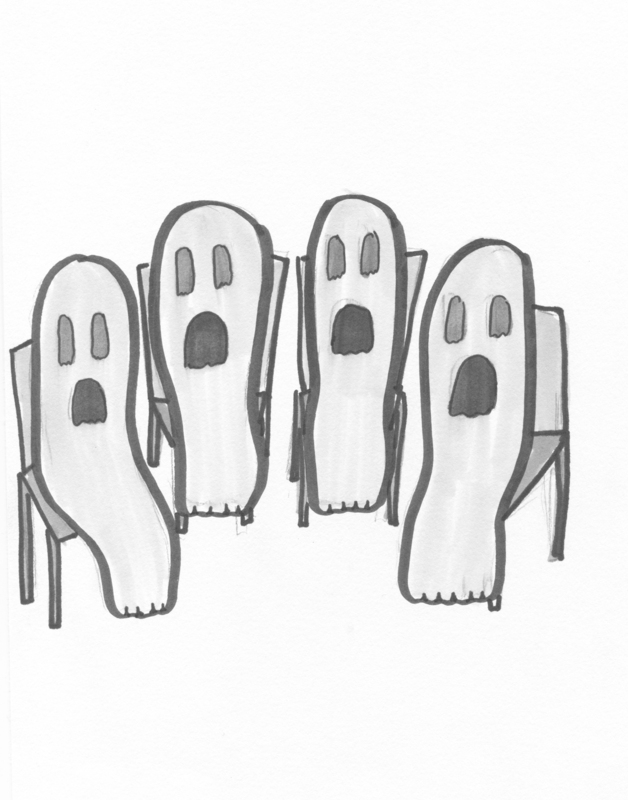 Often, ghosts feel unsafe going to HAUNTINGS because of the human stigma against ghost congregation. The parallel world of the undead demands the right to gather safely without the chance of being exorcised in the middle of group therapy. Please, we urge you to abstain from doing anything to make ghosts feel unwelcome in your space. We all have something that makes our lives difficult, but ghosts have to deal with the never-ending and meaningless expanse of time and space every day for the rest of eternity, so perhaps it’s time we gave them a break. Please abstain from burning sage, praying spirits (good or evil) out of your home, or mending holes in white sheets. If you would like to set up your space as a friendly one for HAUNTINGS, consider leaving a jack-o-lantern burning on your porch year-round or leaving self-help books on local gravestones. Isabel Murray is a third-year writing major who strives to make their home into a safe space for ghosts. You can reach them at imurray@ithaca.edu.